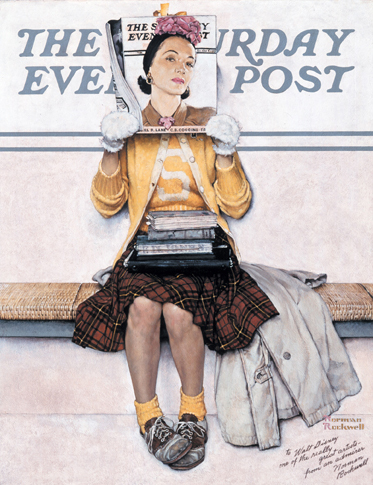 Norman Rockwell (1894-1978), “Girl Reading the Post,” 1941. Stockbridge, MA, February 12, 2019— The Rockwell Center for American Visual Studies at the Norman Rockwell Museum and the D.B. Dowd Modern Graphic History Library at Washington University will bring leading scholars and artist practitioners together at a symposium designed to explore the significance of American illustration and its impact on perceptions and attitudes across time. “Illustration Across Media: Nineteenth Century to Now” will be held at Washington University, in St. Louis, Missouri, from Thursday, March 21 to Saturday, March 23, 2019. “The symposium is the culmination of a two-year project at the Rockwell Center for American Visual Studies,” said Deputy Director/Chief Curator Stephanie Haboush Plunkett. “The Fellowship program was established to invite fresh perspectives and pose key questions relating to the emerging discipline of illustration studies, and to inspire deeper consideration of this important aspect of American visual culture. Panel discussions featuring noted scholars and artist practitioners, lead by Rockwell Center Society Fellows, will focus on the integral nature of illustration across disciplines, in society, history, literature, and the world of art. Topics range from historical subjects and evolving practices, to illustration as it relates to race, gender, and cultural identity. More than 30 panelists, including noted scholars, authors, artists, and graduate students, will present their research during this three-day program. Though omnipresent in design, advertising, publishing, and entertainment, illustration as a field of study remains relatively unexamined. The conference¬¬ will connect scholars, researchers, and artists from across multiple fields to spur dialogue about illustration as a cultural force across time and platforms — from printed mass media in the mid-nineteenth-century, to digital media prominent in the twenty-first-century. The Rockwell Center for American Visual Studies at the Norman Rockwell Museum and the D.B. Dowd Modern Graphic History Library at Washington University in St. Louis have worked closely for more than a decade to preserve, share, and inspire engagement with the art of illustration—imagery created expressly for the covers and pages of books, magazines, and other publication platforms, rather than for the walls of galleries and museums. Collaborations have included such exhibitions as Ephemeral Beauty: Al Parker and the American Women’s Magazine, 1940-1960; publications like Stick Figures: Drawing as Human Practice by D.B. Dowd; and the Society of Fellows, an illustration think tank at the Norman Rockwell Museum. At the conclusion of the conference, a roundtable discussion with Rockwell Center Society of Fellows members will explore the future of illustration, with an emphasis on advancing the nascent field of Illustration Studies. Professor and award-winning author Michele H. Bogart, Ph.D. has taught art history and American visual studies at Stony Brook University since 1982. Associate professor of English and American Studies at Purdue University, Christopher J. Lukasik, Ph.D. has been published in over a dozen journals and has received over twenty fellowships for his research. Award-winning author Erika Doss, Ph.D. is a professor in the Department of American Studies at the University of Notre Dame. D.B. Dowd, Senior Fellow, is a professor of Art & American Culture Studies at Washington University in St. Louis, and serves as Faculty Director of the D.B. Dowd Modern Graphic History Library, which was named in honor.